Overhaul overturning the image of the second-hand machine. High quality realized due to the manufacturer of the paper cutting machine. Safety units having passed model tests are installed. We can overhaul your machine at our factory. In the meantime, you can keep operating with a substitute machine we prepare (charged). Your Jackal paper cutting machine will add performance through overhauling. Low-cost ready-to-install recycled paper cutting machines. Jackal paper cutting machine having played the main role in the paper cutting field is overhauled to become model FC3. Though the machine is secondhand, FC3 is a genuine paper cutting machine overhauled by Itotec. High quality and safety as well as good cost performance are favored by customers. A multi-function LCD touch panel is installed in view of operability. FC3 considers operability of the operator. A touch panel used for new models is adopted. Entry and checkup of course job details and data necessary for paper cutting jobs are smooth. Work efficiency will be improved. Both accuracy and safety are pursued. The knife boasts excellent accuracy and durable cutting performance due to the double sliding drive with which the left and right worm gears give driving forces. 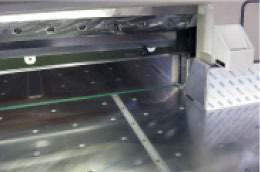 In addition, the design includes safety beam guards and so on to assure safety of the operator. JAC Series having obtained reliability all over the world. 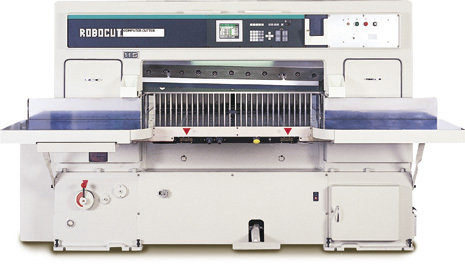 The main body is Itotec’s Jackal paper cutting machine reputed with preeminent performance and little trouble in the world. Its high quality and performance are relied by operators all over the world. FC3 is finished through processes that can be realized by only the manufacturer. All machine parts are disassembled and defects are checked for. Painting is made in the same processes as those used for new machines. Plated parts such as the leveling block surface and wing leveling block are plated again. Test operation, adjustment and accuracy check made for new machines are conducted by experienced operators. FC3 adopts genuine specifications for parts and painting realized only by the manufacturer. High quality is revived through overhaul. The secret is in the technology of the manufacturer. Electric parts, one of weak points of second-hand machines, are replaced with new ones. All other replacement parts are genuine parts. 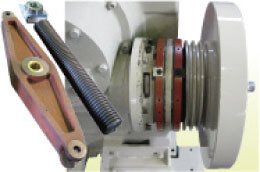 Re-machining and re-adjustment are made by experienced engineers. The leveling block surface and wing leveling block are plated again and the main body of the cutting machine itself is finished with genuine painting. Major electric parts are replaced. All bearings are replaced with new ones. The main body of the machine is disassembled. Disassembled parts are reworked and re-machined. Cast parts are checked for distortion and re-machined. All the plated parts such as the leveling block surface and wing leveling block are plated again. 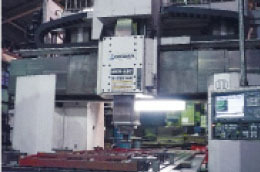 Function setting Sizing feed, stacking, pushing-out, air control, etc.